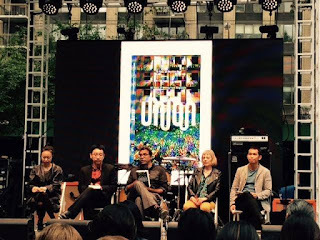 Last Sunday, the NY launch of UNION, an anthology that celebrates 50 years of Singaporean writing and 15 years of seminal American journal Drunken Boat. I read from The Pillow Book at Singapore: Inside Out, with Alvin Pang (editor), Ravi Shankar (editor), Sharon Dolin and Amanda Lee Koe. Photos by GH. Tara Bergin, a poet whom I admire greatly, mentions Steep Tea in her reading list for POETRY magazine's Editors' Blog: "Particularly striking about this book is the way that every poem has an epigraph; brief quotations chosen from a diverse set of sources. The impression is of a writer for whom reading represents a vital part of the creative process." Yesterday's Singapore Symposium was an experiment and a gambit. To host speakers from the different fields of academia, the arts, and social work, with their different concerns and languages, was to take a risk. I think the bet paid off handsomely. Adeline Koh's work on digitally archiving "Chinese Englishmen" provides a necessary counterbalance to the current focus on the major Victorian authors, all white, mostly men. Listening to Jini Kim Watson, I was struck by how many countries in the world aspire to build modern cities like Singapore and so replicate its social control and public order. E. K. Tan spoke about the politics of using dialect in Singapore's Sinophone literature. I especially enjoyed his close look at xinyao (Singapore ballads) and Kuo Pao Kun's play "Mama Looking for Her Cat." Last night was the opening party of Something to Write Home About, the Singapore arts festival in New York wholly organized by Singapore creatives and volunteers based in the city. The basement of La Mama Theater was transformed into an art gallery. There was plenty to drink. Peranakan food was served. The festival director Hong-Ling Wee was, naturally, flushed with excitement. I was again impressed by her ability to connect with people when she spoke to the room. It was lovely to see friends again and to meet new people, among which were an Indian classical dancer born in Ferguson, MO; a young Malaysian diplomat; and a Singaporean new-media artist based in Chicago. Carol Rumens on "Steep Tea"
"In His Other House" is Carol Rumens' Poem of the Week in The Guardian. So happy about it. Thank you, Ms Rumens, for your insightful reading of "In His Other House" and your sympathetic response to Steep Tea. Poem: "The Book of Nature"
I run so fast I run into the past. "What must or might be said now about poetry?" I might have said something to the Progressive Poetics project, initiated and organized by H. L. Hix. The Progressive Poetics project asks each contributor to respond, in light of something she or he has already said in print, to this question: “Poetry makes nothing happen.” (W. H. Auden, 1939) “To write poetry after Auschwitz is barbaric.” (Theodor Adorno, 1949) Though often cited as timeless, authoritative truths about poetry, those two pronouncements were made at particular historical moments, in particular cultural contexts, and from particular subject positions. But we (choose any “we” from those of us alive now) occupy various subject positions, live in various circumstances, and stand nearer the mid-twenty-first century than the mid-twentieth. It is not self-evident that we should (continue to) defer to Auden and Adorno, so: What must or might be said now about poetry?